Preheat oven to 450° with pizza stone or skillet on the rack second from top. Mix Jemila Bread Mix and water until water is fully absorbed and dough is smooth. In a food processor, process 2 minutes on high. Spread the olive oil on top of the dough. Cover with plastic wrap and let sit in a warm place for 20-30 minutes. Cut dough into 4 balls. Roll one ball at a time with a rolling pin until dough is 1/8” thick or about 8” in diameter. Open oven, slide out the rack enough to put the flattened dough onto the stone and bake for 1–1/2 to 2 minutes. Turn the bread over and bake 1-1 /2 to 2 minutes more. Slight brown spots will appear on the dough when done. Can also bake stove top in a heavy skillet on medium heat. Make sure the skillet is hot before the first bake. 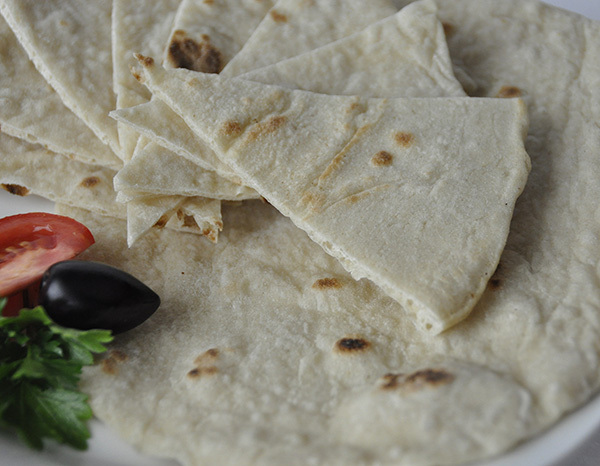 For Syrian Bread, spread dough on a sheet pat 1/2” thick. Lightly mist with olive oil. Let rise 1 hour. Bake at 350° for 15 minutes or until golden brown.